“I see a red door and I want to paint it black…..” Every time I see black painted rooms, it makes me think of that song. Just like the Rolling Stones, black will never go out of style. However, it is not a color that works for everybody, but when it does, black painted rooms can be quite spectacular. 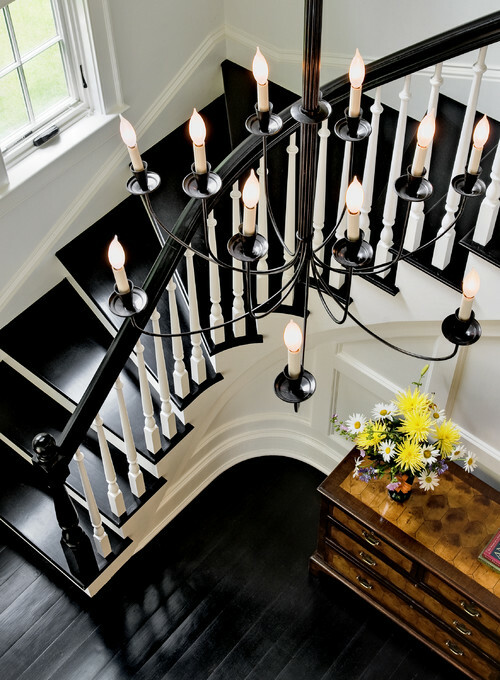 Whether a little or a lot, black is a color that shouldn’t be ignored in a home interior design. These next few rooms will demonstrate some suggestions for how to use black to create high drama and sophistication. 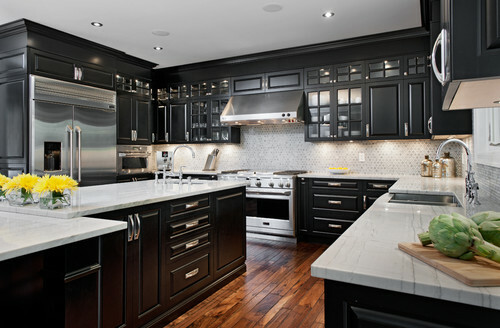 Although gray and pastel kitchens will see an increase for kitchen cabinets during 2016, black kitchens will also continue to hold their ground. They add a sleek and modern touch to any kitchen. Plus, dents and dings will not show up on black cabinets the way that they will on lighter colors. Just like a nice pair of shoes, black cabinets go with just about anything. From the rustic wood flooring to the sleek marble countertops, they seem to tie this ensemble into one unified room. If you are one of the people that falls more in line with the “less is more” motto, perhaps just a single cabinet would be more your cup of tea. Here, a built in unit was painted black to distinguish it from the rest of the cabinetry. This draws the eye to a lovely display of the owner’s favorite dishware. 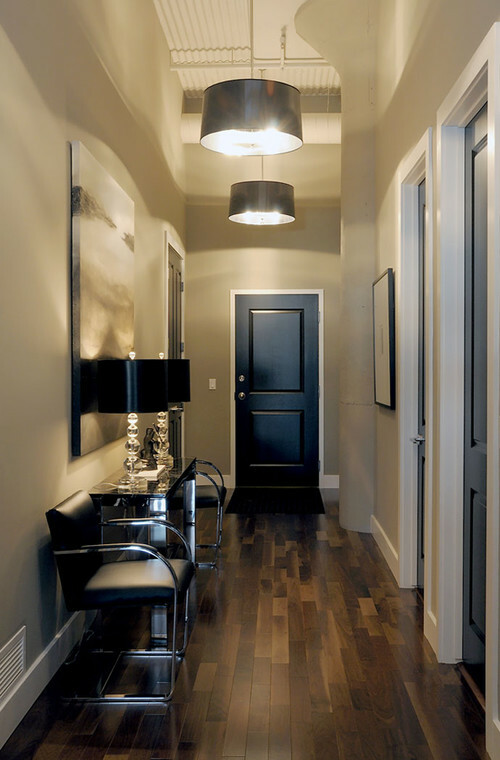 A great way to add drama to your interior design is to paint a door black. (I guess the Rolling Stones were ahead of their time). Because it draws the eye, the black door diminishes the impact of the TV screen and the fireplace when they are not in use. Otherwise, the eye simply sees the dark emptiness from those items. (After all, no one is going to have their TV and fireplace going all the time). The doors down this hallway create a chic look that white paint just can’t reach. Always consider black accents against beige and gray walls. Where black on white walls is a classic, minimalistic design, black on beige/gray lends an elegance to a room that is warm and inviting. So, it works very nicely with traditional or transitional designs. 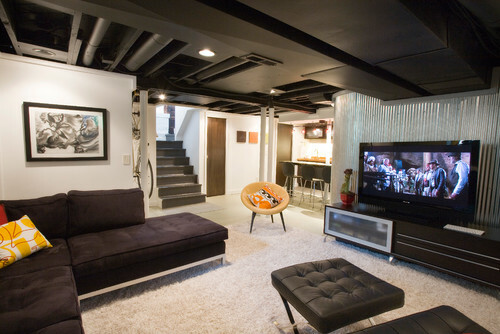 If you have a room that is designated to movie time, a black ceiling can be just the ticket to increase the experience. Not only will it cause the ceiling to retreat, as it does here in this basement’s low ceiling, it also will reduce glare on the screen. Black ceilings do not need to be reserved for basements, though. 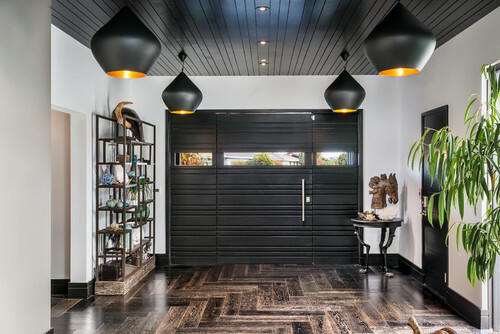 This black ceiling, combined with the ceiling fixtures and garage imitation doorway, lends to this swanky contemporary space. 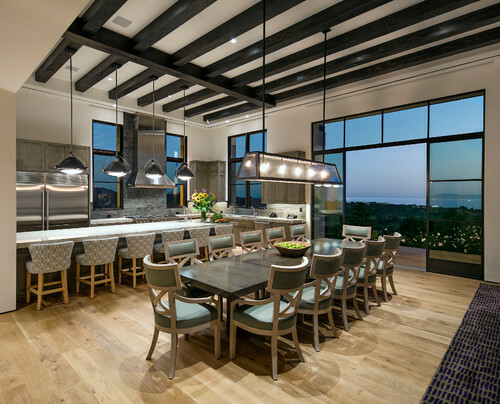 If a room has spectacular architectural features, such as these ceiling beams (and this amazing view,) black paint can increase the impact. Because white paint would visually cut up the skyline, black trim on these windows allows the frame to better recede into the background. While, the black painted beams laid against the gray beige ceiling adds an impressive element. This is another perfect example of beams and trim being finished in black. However, this demonstrates that even with a more traditional style black paint still works. Now, I know, I know. Before I am bombarded with a ton of comments telling me how hard black floors are to keep clean, I feel you. However, I still felt compelled to include this incredibly high drama design. Yes, black floors and stairs would be a cleaning nightmare to many (especially those with small children or pets), but for those that are up to the challenge….. WOW! This is definitely an impact statement. Although it has many elements of a traditional design, my mind immediately cries gothic elegance. The perfectly finished steps against the detailed trim on the wall has me drooling. This beautiful bedroom also has a bit of romantic goth to it. While the credit description labels this room as Modern, I would have to say that it actually falls more in line with a transitional style. ( Although there is an Eames chair, a truly Modern style would not include the traditional chandelier or the Victorian-esque bed, but I digress.) Regardless, this room is simply breath taking. A black painted powered room has the potential to bring high impact to a small space. But if going this dramatic, I would suggest utilizing a few mirrors to reflect the light. 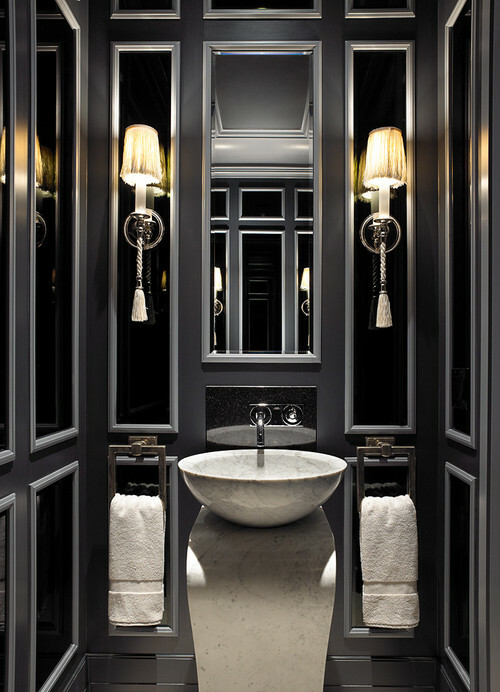 But, black painted rooms like this will create a high glam atmosphere. It makes this small room feel like a grand estate.